This supplement for Crimson Skies gives an overview of the current state of fractured North America as well as the rest of the world. All the major nations around the globe are detailed regarding politics and economics. This of course includes relations to other countries and also exemplary aerial units and pilots. Prior to this, a recount of the history between the Great War and the current date is given. At the end of the book several new fighters are introduced, which can immediately be used in the scenarios presented. Like Pride of the Republic, this supplement is mostly written from an in-universe point of view, this time by none other than Paladin Blake from the highly regarded Blake Aviation Security. First, we get a short introduction followed by a few pages of a history lesson that explains how the world came to its current state after the Great War. Then comes the main part of the book: roughly 60 pages detailing all the North American nations present in Crimson Skies. The descriptions of the most important powers in Europe, Asia and the rest of the world follow suit, but are less detailed. This main part also supplies scenarios for all regions presented in sidebars. The last part gives us a few new aircraft, not only in writing but also providing record sheets. The artwork in this supplement is typical of its time: mostly black and white (and gray) drawings. What I find a little awkward is the different styles of the images presented: some look like pencil drawings, some like charcoal renditions, others seem like right off the drawing board, still others like stock images that had some filter plastered over them. All in all, it's still quite solid, but it can't hold a candle to the staged photographs and the render images from the basic game. Exception: front and back cover. These are superb! All right, onward to the individual chapters! This two-page section starts with a foreword by Paladin Blake, followed by a concise but really good "What's Inside" paragraph that wraps up the table of contents rather nicely. The last paragraph tells us "How to Use This Book" and gives some advice on how to play the scenarios presented and what other supplements would be helpful for this. This chapter is actually called "Fall from Grace" and recounts the events from the end of the Great War (aka World War 1 nowadays) up to the current date of 1937. As is the nature of settings like Crimson Skies, up to a certain point we have the real-world history, but at that point events happen differently, have different outcomes or do not happen at all, leading to that alternate history. But what I find the most fun is the smooth transition between these histories. And unless you're a history nut you probably won't notice where this transition starts. Summarized, I really like this part of the book as it gives you the (fictional) background that all characters in that setting know and are aware of. Half a star short, because its merely knowledge of days past, without much impact on scenarios or campaigns of the actual board game. The biggest section of the book starts with a preface written again by Paladin Blake and summarizes why North America fell to pieces. The states are grouped by region: Northeast, Southeast, Midwest, Rockies, Southwest and West Coast. Each region section starts with an overview of the general situation, followed by a paragraph "What the Papers Say". This part gives us newspaper articles from various cities in the region, commented on by Paladin Blake e.g. in regard to accuracy. Afterwards all nations in that region are detailed with a nation-specific summary and overview, paragraphs on politics and economics and of course noteworthy pilots and units. Also allies and enemies (i.e. threats) are being described. This is basically the formula for all nations covered, be they regular ones (like Texas or the Empire State), emerged ones (like the Navajo Nation or the Lakota Territory) or questionable ones (like the Free Colorado State). All told, this section gives a lot of information about all the established nations in North America, which one should keep in mind when designing campaigns. Not all of it is that interesting to read, though; I must admit that I found myself reminded of geography and history classes when reading all the paragraphs about economics and politics. On the other hand, I really liked the opening section with commented newspaper articles. The information should prove quite useful for GMs or interested players, but not of much value for the raw tabletop game, thus two stars. I'm merging these parts as they are quite similar; also, they follow the same basic formula used with the fractured states regarding the information we're given. We get yet another foreword by Paladin Blake telling us how the general situation in these parts of the world is like and that BAS and their partners can help you even in those remote locales. Both regions get their own overview, but the actual sections for the individual nations are rather short. The biggest difference here is the lack of any newspaper articles. The reason is explained by Paladin Blake who says that accurate reports are hard to come by from most of those countries. This is especially true of the section about Russia, which gets only a general paragraph without any information about economics, politics, units or otherwise. The brevity of this section is understandable both from an in-game and from a publishing point of view, but as other supplements (which were never released) would have tackled only North American nations in greater detail, I had hoped to find a little more substance here about the rest of the world. The chapter with the most impact on the board game begins with an explanatory note by Paladin Blake. He points out that some of the planes presented are brand-new while others have been serving for quite a long time by now, but none of them have been detailed in other publications yet. The following fighters are then presented on double pages: Rolls-Royce Phantom, Mitsubishi A5, Yakovlev YAK-4, TNCA Cazador, S.I.P.A. M112, Focke-Wulf Hellhound and the Fairey Swordfish. The layout of these double pages is basically the same as e.g. in the Aircraft Manual: some (real-world) statistics first along with armament, then a general description of the craft. Two more paragraphs follow: "Design History" and "Role and Deployment". The rest of the pages is filled with a picture, a technical drawing and a box with the game statistics, including Special Characteristics. Also, we are given a list of nations that usually employ the specific craft. 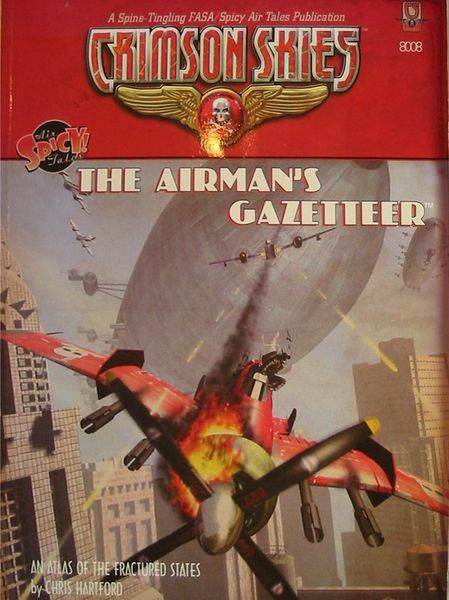 Not only for the welcome addition of seven more fighters to the Crimson Skies roster does this chapter receive full three stars, but also for the high-quality writing and layout of the pages. The inclusion of the record sheets was nice back when this supplement was published, but nowadays you'd most probably print them instead of copying. Also, the sheets don't list the planes' Special Characteristics but the regular experience points box, which isn't really needed that much during play. While the introduction of new fighters is always welcome, the main attraction of this book lies in establishing general lore for the setting. It should therefore be of interest for both GMs and players alike, when contemplating border skirmish scenarios or full-fledged international campaigns. Because of the rather dry informational parts about the individual countries and the limited usefulness for casual flyers, this supplement receives two stars from me, but nevertheless a clear recommendation for all pilots with higher aspirations. Nice review..! It's a Thumbs Up from me.